Carpal Tunnel Syndrome which is abbreviated by the medical profession to CTS is more common for women, affecting 5% of the female UK population, and approximately 3% of the male population. It tends to be more frequent with increasing age but can affect people of all ages. The Carpal Tunnel is a tough fibrous band at the base of your wrist that acts like a tunnel through which the Median nerve travels. The Median nerve is responsible for both sensation and movement in the hand. It is this ‘trapping’ of the Median nerve that gives the symptoms of CTS. How does the Median nerve get trapped? The nerve may not always get trapped as such but may be subjected to pressure or compression which will then cause the symptoms of CTS. 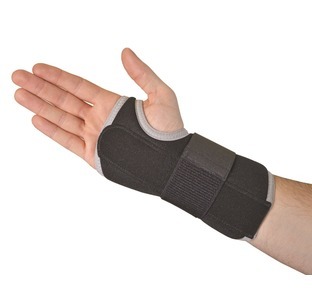 Wrist injuries such as fractures and sprains can cause swelling which compresses the nerve. Family history. Approximately 25% of those suffering CTS will know a family member who has also suffered. Repetitive Strain type activities which may involve strenuous work with the hand or wrist. Working with pneumatic drills, chainsaws and other vibrating tools is often associated with CTS. Menopause. CTS has an increased incidence in women during the menopause. Pregnancy. Approximately 50% of pregnant women will suffer from CTS. Some health conditions such as those suffering from RA (Rheumatoid arthritis), Diabetes and Thyroid disorders are associated with CTS. For many people there may not be an obvious or known cause of why they have CTS. The typical symptoms of CTS are listed below but like many conditions affecting the body there may be variations of symptoms. Tingling, numbness and even pain to the hand and fingers. The tingling and numbness will classically affect your thumb, index and middle finger and half of your ring finger. See the diagram below. Usually worse at night and first thing in the morning. People will find they often shake their hand to get relief. Some people will experience an ache not only to their hand but also extending up the arm. In severe untreated cases the muscles of the hand can become weak and waste away. Your GP will usually be able to confirm and diagnose carpal tunnel syndrome. This may be done by a physical assessment of your hand and fingers and also some simple physical tests. If your GP is uncertain or you have severe symptoms then you may be referred for further tests. 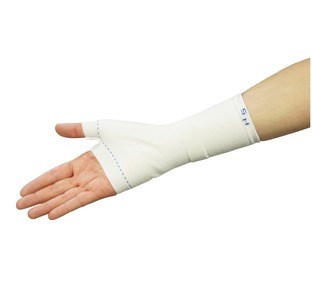 If your wrist is swollen due to a RSI type injury or sprain then the application of a cold compress or gels can be helpful in reducing any swelling and thus pressure to the carpal tunnel. The use of a wrist support during the recovery will also be helpful as this will help keep any swelling down to a minimum while the sprain heals. CTS during pregnancy is usually self-limiting and will typically resolve within a few weeks after the baby has been born. The use of a wrist splint can be very helpful at managing the CTS during pregnancy. 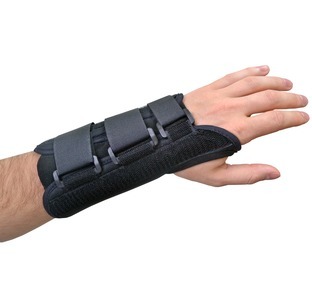 A wrist support/splint worn at night is often a very effective self-help treatment but do allow up to four weeks of wearing the wrist splint before seeing an improvement in your symptoms.